Lately, I've been noticing these cute little framed chalkboards included in dreamy interior photos, used as props in photo shoots and also many other places. 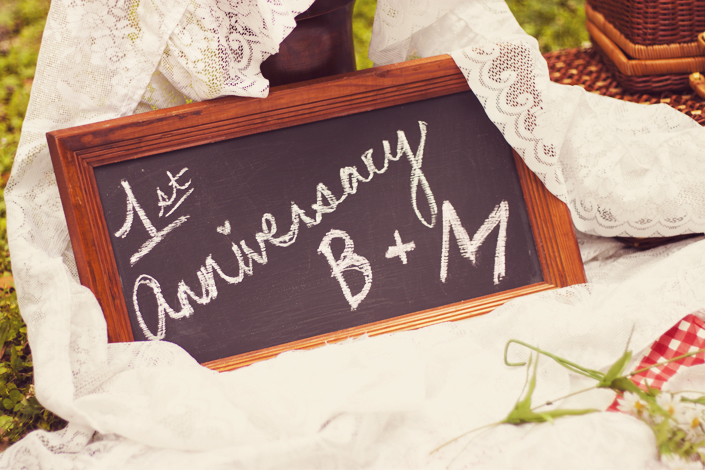 I love the natural, rustic look they have and I recently got the idea to create my own to use as a prop for a photo shoot I did of my best friend and her boyfriend's anniversary. I then found out how extremely easy it is to make one of these, so I thought I would share this little DIY with you all! Picture Frame - You can pick what ever size and type of frame that you would like. I recommend looking for one at a thrift shop, that's where I found mine. Make sure you get a frame with the glass in it. You can get a piece of glass cut for your frame if you want/need to, but I just found it was a lot easier and cheaper to go and find a frame with the glass in it at my local thrift shop! Chalk Board Paint - I found my paint at home depot, but I'm sure you can find it at any craft stores as well. Paint Brush - Any size paint brush should be fine! Chalk - I accidentally forgot to include the chalk in the photo, but it is of course a very important part of the project! I found my frame at a thrift shop for only about $2 I believe, and the paint was $10 for the can. This project also barely uses any of the paint, so you can make multiple framed chalkboards with it! The paint brush only costed about $1 and the chalk costed about $2-3, so I would say this is a pretty cheap project, and you'll have extra paint to make more! Okay, so there's literally only about 3 or 4 steps to this project. Very short and easy. Firstly, you just remove the glass from the frame. It personally took me quite a bit of work to pry off the glass from the frame without breaking it, so a little screw driver came in handy when doing so. 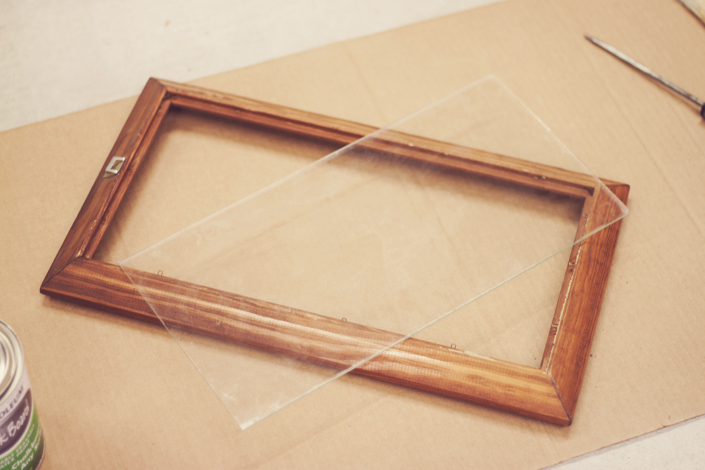 After you remove the glass, set it on a piece of cardboard or something that you don't mind getting paint on! 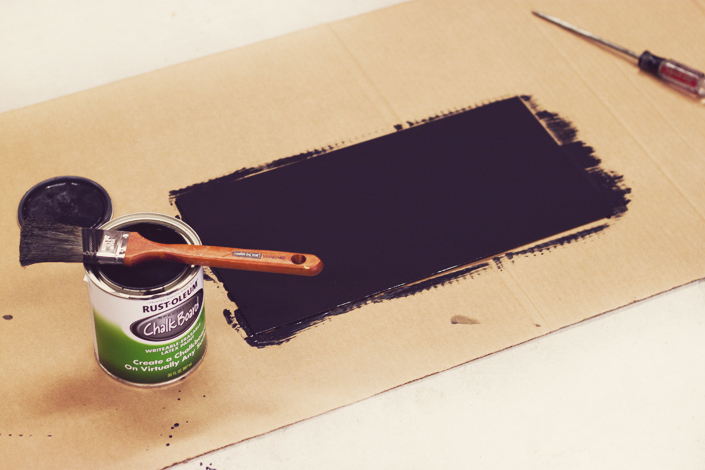 After your glass is on your cardboard, open up that can of paint of paint on your first coat! After that, just let your frame set out for about 3-4 hours, then apply another coat of paint. 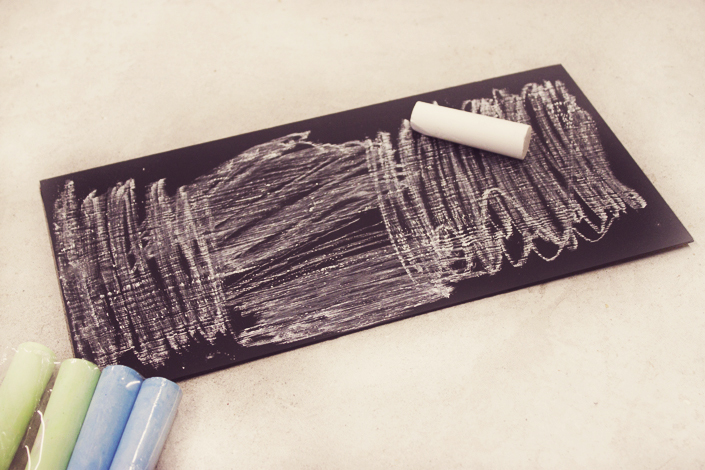 Repeat this about 3 or 4 times to make sure your chalkboard has a good amount of thickness. Once this is done and you know that your chalkboard is dry, take a piece of chalk and scribble all over it, sort of as a way of "breaking it in" and making sure you can write on it well. Then just put the frame back on it, and you have your framed chalkboard! Easiest project ever. This easy little project is great for a prop in a photo shoot, or for random uses around your home. I've really been enjoying writing to-do lists on mine and also cute little messages and quotes. You can also set it up or hang it anywhere in your home and it will look nice! I think they're especially great for kitchens and offices! Hope you've enjoyed this little DIY. It's nothing fancy, but that's whats good about it, right? So creative!! I love it!